Last year we reviewed OCZ's RevoDrive Hybrid, which saw the marriage of a 1TB hard drive and a pair of 50GB SandForce SSDs on a PCI Express card. The idea was to use the SSD controllers and 100GB of NAND flash as a high-speed cache for the much larger spinning disk drive. Potentially achieving performance close to that of a SandForce SF-2281 SSD with a 1TB storage capacity was very appealing, however there were some notable drawbacks. At $US485 (since dropped to $US330), the RevoDrive sounds like reasonable value at $US0.48 per gigabyte (in SSD terms), but in reality the RevoDrive Hybrid performed nothing like a high-end SSD in most tests. As a result, we had a hard time recommending OCZ's hybrid solution. 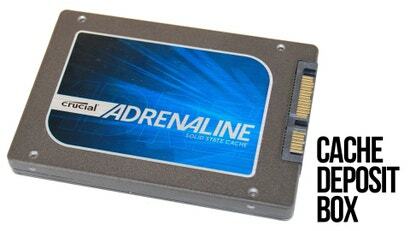 Then on January, Crucial announced their latest SSD series called Adrenaline. 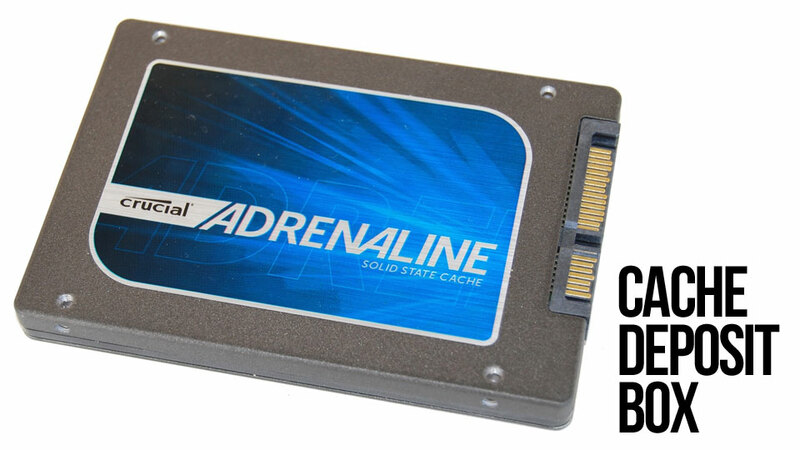 Not meant to replace their existing and well regarded m4 SSDs, the Adrenaline is a cache solution meant to work along your existing disk drive, using a 50GB SSD to act as solid state flash-based cache for your larger primary hard drive. OCZ also offers a similar caching solution called Synapse, which comes in 64GB and 128GB capacities. Though after our review of the RevoDrive Hybrid, OCZ didn't seem so keen for us to take another pass. Essentially what we have is Crucial's answer to the OCZ Synapse. The Adrenaline costs $US110 for the 50GB version, while the slightly larger Synapse costs $US135. Note that Crucial's drive allocates 50GB for caching while 14GB is provisioned for performance optimization, so really both drives feature 64GB of NAND flash memory. 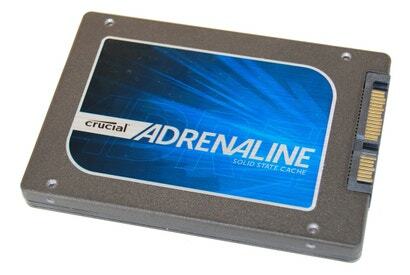 The Crucial Adrenaline looks like a typical SSD and that's because it is. The drive is based on the m4 design featuring the same controller and NAND flash memory. Crucial claims the Adrenaline can achieve read speeds of up to 500MB/s and write throughput of 95MB/s, the same figures they claim for the 64GB version of the m4. Of course, ultimately those speeds will be determined by how well the caching software works. The Marvell 88SS9174 controller along with a large 256MB cache are used to improve small write performance and eliminate any 'stuttering' issues. The Adrenaline is equipped with 8x8GB 25nm chips (29F64G08CFACB) and feature Micron's high-speed ONFI 2.1 NAND interface for 166 MT/s with 512-byte industry standard sector size. Like all SSDs, the Adrenaline cites very low power consumption figures, at idle it uses less than 100mW and when active consumes just 150mW. It measures 100.5 x 69.85 x 9.50mm and weighs 75 grams. The drive is compatible with both laptops and desktops. Crucial supplies a 3.5" adaptor in case your chassis doesn't have a 2.5" bay. The Adrenaline can only be used as SSD cache for the primary boot drive as the Dataplex software will only select C:\ as the primary storage drive, this makes sense for the most part and was also the case when testing the RevoDrive Hybrid last year. The drive doesn't require any special drivers as it uses the SATA interface. Furthermore, the Adrenaline can be installed at any point and can therefore be fitted to any computer without the need to reinstall Windows. You might recall some of the nuissances we went through when using the Dataplex software the first time we touched it, but here's a reminder. Undoubtedly the software is a central component to enable the caching feature and the Adrenaline ships with a one-time use product key that will be rendered invalid if any major hardware changes occur. Instructions indicate that if you uninstall the software before making any hardware changes and then reinstall afterwards, this will avoid the key invalidation. However we tried this to the letter, and after uninstalling the software we then attempting to re-install on another system we could not get past the key activation screen as we were hit with a licence in use error. Even worse, the system we uninstalled the software from and removed the Adrenaline become corrupted. Upon boot up we were hit with the "Press CTRL+ALT+DEL to restart" error message as the partition had been damaged. On a brighter note when we reviewed the RevoDrive Hybrid we were told that the Dataplex software monitors network controllers, memory configurations, operating system, primary boot drive, CPU and BIOS for any changes. If two or more of these components are changed the key becomes inactive and the user is forced to contact the manufactures tech support department for a manual reset. Before benchmarking the OCZ RevoDrive Hybrid, we decided to test how fussy the software was regarding hardware changes. RAM is one of the most commonly upgraded components in my computer, so we swapped out a pair of 2GB sticks for two 4GB sticks and then disabled one network controller and enabled another. Having booted back into Windows everything seemed fine, but after about 10 minutes a popup message said the licence was in use by another computer. We uninstalled the Dataplex software and attempted to reinstall it after a mandatory reset. However, because we didn't uninstall Dataplex before the hardware changes, we couldn't reinstall the software using the same key. After acquiring a new key from OCZ, we were able to reinstall the Dataplex program and continue benchmarking. We were again hit with the "license is in use by another computer" error after running a number of Windows 7 updates. This was a nightmare and it was one of the contributing factors for why we disliked the RevoDrive Hybrid. So does the Adrenaline suffer the same fate? 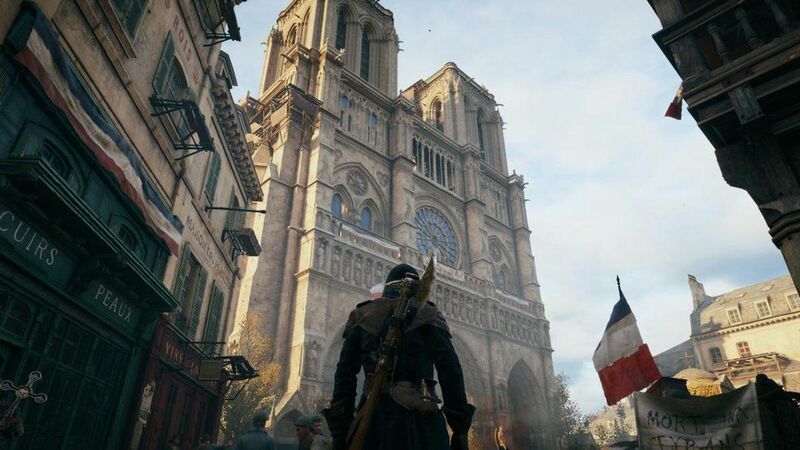 We had expected that it would give it uses the same Dataplex software. However it seems NVELO might have made some changes to the security of the Dataplex software we found the Crucial Adrenaline much more forgiving. In fact we were able to update the system BIOS, change video cards, memory and processors without tripping the Dataplex security measures. 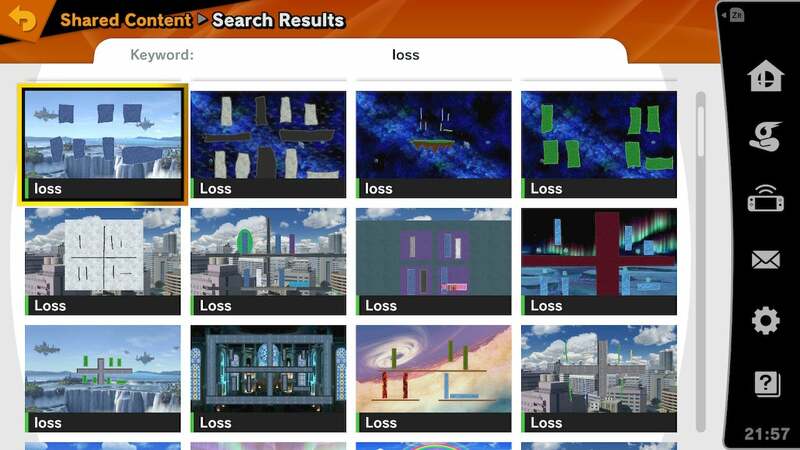 There has been more than half a dozen updates made to the software since we first tested it so we wonder if NVELO has made changes here or were we just lucky? Based on previous experiences we suspect they have lessened the security measures. Overall, the installation process is very easy and once installed, the Dataplex software need never be opened again — unless you wish to make any serious hardware changes, of course. 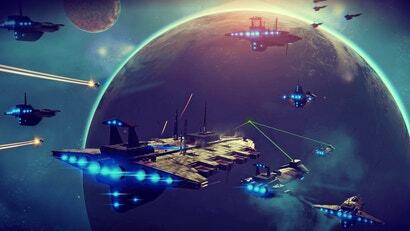 Steven Walton is a writer at TechSpot. TechSpot is a computer technology publication serving PC enthusiasts, gamers and IT pros since 1998. I just use a 120GB SSD for my OS and whatever 2 or 3 games I'm currently playing and a 1TB for backups and movies and music Etc.Games are getting HUGE though, Shogun 2 with all rhe exspansions is 29GB! Are these cache drives worth the hassle when you get just get a Seagate Momentus XT and not have to mess around with software and licensing?